Maths is rarely a favourite subject amongst students. Pages of sums tend not to excite young learners. However, by making Mathematics a part of everyday life, you can encourage your child to see that numbers can be enjoyable and satisfying to play with. From the local shop, to the dinner table, Maths can be seen wherever you turn. We've put together a few ideas based on helping your child to think numerically and polish their skills. From prices, to quantities, to weights, supermarkets and shops are filled with numbers. Whichever level your child is working at, try to devise appropriate questions and tasks for them in order to bring a little variety to the shopping experience. Direct them to pick seven apples or weigh out 400g of bananas. Request that they choose two yogurts per person in your household. Ask them to work out which of two kinds of pasta is the cheaper per kilogramme. Many supermarket trolleys come with a calculator attached. Encourage your child to experiment with these. They could even try adding up the cost of that day's grocery shopping as you move about the store. In these way, Mathematics can be dynamic, hands-on and active, bringing everyday chores to life. Why not invest in a couple of audio tapes or CDs which present the 'times tables' in song format? These are perfect for the whole family to sing along to and are highly effective in helping young students to commit sets of numbers to memory. In this way, your child can revise for their upcoming tests mid-journey and enjoy a little music at the same time. If you child is fond of asking, "Are we nearly there yet? ", why not deflect such questions with Mathematics? At the start of the trip, tell your child the distance that needs to be covered. Rather than giving them a time estimate, let them know how many kilometres have been travelled or how many remain. Let them know the speed at which you are travelling too. Cooking and preparing food can be an ideal opportunity for children to see how Maths is essential in everyday life. From cutting a cheese cake into fifths, to doubling up the quantities in a recipe, numbers and fractions can be seen in concrete form. Engaging in such activities can be particularly useful for those who find it difficult to visualise things when it comes to Mathematics. There are plenty of educational board games which are geared to boosting the numeracy of the young. Toy shops, gift shops, large newsagents and the Internet are great places to look if you fancy investing in one or more of these. Alternatively, traditional 'family favourites' can also be used to your child's educational advantage. If you are playing Monopoly, for example, charge your child with the responsibility of playing banker. Many children have a fear of figures. This need not be the case. Incorporating Mathematics into your child's everyday life will encourage them to note the importance and prevalence of numbers. 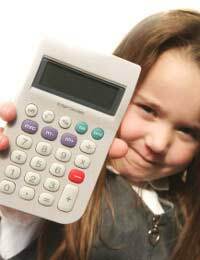 Your child will soon gain confidence in adding, subtracting, dividing, multiplying and more. In this way, number crunching outside of the classroom will have a direct and positive impact on your child's school work.